Tara and Rama (together): Greetings! Tara: Everyone! Oh, my goodness. Rama: Thank you so much Sekhmet and Eli. Tara: Eli – wow! Okay, yet the Faction 3 White Knights said a lot too. So, we will start on Sunday with “Rama Speaks.” On Sunday Jack the Alien Hunter and Red Rock. He called me, Rama says, Sunday afternoon and introduced me to a team member, a new one of the Faction 3 White Knights to all of us. His name is Red Rock Rainbow Hawk. He is part of the Bird Tribes of Blue Avians and that, in particular, he is of the Horus Clan. Red Rock Rainbow Hawk continued, “There are extremely wonderful uplifting things happening on Terra Nova right now. He also said our Sun, Sol, is going through a period of high solar flare activity which as we attune to this activity with open hearts, creative energy and inspiration can animate our Being and we can spread more Joy.” Red Rock Rainbow Hawk said that we can choose extreme happiness at this time, even in the face of this outgoing darkness. As the bumper stickers say, ‘Commit random acts of kindness’ everywhere. We have the power to change the world this way. Let us be positive. Red Rock Rainbow Hawk referred here to the people at Obama's talk in South Africa. 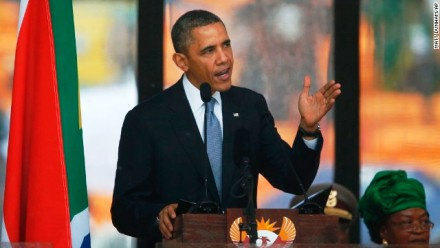 As 15,000 people who came to hear Obama give his speech in honor of Mandela's 100th birthday celebration in South Africa, Johannesburg, they started chanting all together “Yes, we can!” in unison, over and over and over again. Red Rock Rainbow Hawk went on and said, “Feel the application of this tremendous flow of positive Love energy, pouring in now to assist us in this great transformational time. Continue to shower Love, especially upon those who we may call our enemies. Red Rock Rainbow Hawk said to me in closing, “We will meet again soon. See you in the Light of the Most Radiant One and on the Bridge. As John Lennon and Yoko say, ‘All we need is love,’ Lord Rama, ‘And all we are saying is give peace a chance.’ Namaste! Michelle for leader of the High Council of Wise Elders on Planet Earth! Sat Nam! NESARA now! And I would just suggest that you read the whole thing or listen to Obama's speech. We did play it on Friday night [on bbs radio]. Okay, so we go the next period here, Monday. Rama Speaks, I called Natasha today. She told me we are at a critical juncture with the energies on the Planet right now. And as we are approaching this Full Moon/Blood Moon total and longest lunar eclipse in the entire 21st century, the 13 Families, metaphorically speaking, want to use these same energies to cast a permanent shadow of war forevermore on this Planet. Natasha in response such dark intentions said to me, As Captain Ashtar and Dr.Greer have said, ‘No nukes.’ Natasha went on to say, As we use social media make absolutely sure to tune into the positive and totally eliminate the negative. For example, anything or anyone coming from using organized religions, especially evangelical political pundits of a Republican leaning who are representing this information always, specifically a more recent report from evangelical minister Hal Turner has brought up this statement. Natasha said, Rather than listening to desperate polarized conjectures and political fake news, we need to use the energies of the Violet Transmuting Flame of Saint Germain to support what we know to be true, which is that this entire global treasonous economy imposed by the Reptilian dark cabal worldwide will be totally shut down. In its place with full Galactic intervention of Saint Germain and the Violet Flame along with the Ashtar Command and Archangel Michael’s legions upon legions of Light, in tandem with the 20-million-strong Sovereign World Militia forces of Faction 3 White Knights, arrest the remaining Cabal who are the 500,000 who have not yet been rounded up. And then there will be a global simultaneous EBS - Emergency Broadcast System alert universally on all communications devices, meaning all TV, Radio, internet, shortwave radio and cell phone devices on this emergency broadcast Galactic report of the Ashtar Galactic representatives of the Ashtar Command along with ground crew representatives of Faction 3 White Knights. For instance, Lady Master Nada and the King of Swords who work together with the White Knights representatives, whistleblowers such as Amy Goodman, Noam Chomsky, Katrina vanden Heuvel and 19 or more altogether, will announce the enactment of NESARA Law on a global scale, along with Full Disclosure. We have been told that Saint Germain and Ashtar himself will be on the TV set with these people. The real Ashtar Command will be taking this one in hand. No other programs and only rainbow bills will be enacted with a basket of currencies. 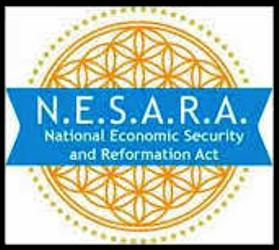 Nothing has been delivered in any kind of other form of money that has anything at all to do with NESARA Law at all. In the meantime, Natasha said, RT-TV is a good place to get real news. Also the Empire Files with Abby Martin brings in-depth discerning truth, with the enactment of NESARA Law. The establishment party system, both the Democratic and Republican establishment part of the party system will be completely dissolved. Saint Germain will also be addressing the World along with Music of the Spheres coming in on the transmission wires. Please remember to stay calm and suspend all of our disbeliefs for sure, and know the Ascended Masters will only transmit to the extent of the belief system of one who is channeling them. We will say more about this next time. Namaste, Lord Rama! NESARA now! May Peace prevail on Earth! Sat Nam! Michelle for Leader of the Grandmothers, the High Council of Elders, Grandmothers - Divine Feminine! Then we come to today. Rama Speaks, This is a text message I got today directly from the Dalai Lama. "The kind of behavior that really is spiritual practice consists of refraining from falsehood and abiding by the truth, neither humiliating nor mocking of others, being humble and having a good heart and helping others. What these three told me again as they were saying, Jack the Alien Hunter and Red Rock Rainbow Hawk, on Sunday, "Number 1- There is no G-sara. Number 2-There is no RV, there is no global currency revaluation. The Dark Side of the Force are running these fake programs, as a means of hooking people, especially lightworkers, into believing ‘false evidence appearing real’ and covering up the true NESARA Law. And even more challenging are messages from others who believe in these programs and are thinking they are getting messages from the real Saint Germain, connecting these programs to the truth. It is not true! That being said, Saint Germain who is facilitating NESARA is in a physical body and has been for decades and decades and decades, and he never left his body as a matter of fact. He's been appearing and disappearing from the time of being Francis Bacon - he never died. And as we have told everyone many times, he has an office in DC and two offices in Virginia. That's who the Faction 3 White Knights work with and communicate with him on a daily basis. These other programs have nothing to do with Saint Germain or NESARA Law in any way, shape or form. The Dalai Lama is a Faction 3 White Knight. His message to me today is precisely speaking to this mind control fake programming. It is imperative to discern with greater vigilance what we are attaching our energies to, as we cannot serve two Masters. The entire money system has to be completely dismantled first before any money is diseminated to the level of We The People from NESARA funding. There has been distribution of gold certificates primarily to wealthy visionaries and also to Faction 3 White Knights, which took place between 1996 and 1999. A good example of one of these people who received certificates is the Poppy Lady. I saw these certificates in 1999. She showed them to me. What she was able to do with them was to place one of them into a bank. Then using the certificate as collateral, she has been able to take loans out against the certificate. She has since 9/11 stationed herself in Afghanistan for these past 17 years, coming home rarely to visit her children and her extended family who are here in the States. The rest of her immediate family, sisters, brothers, parents, grandparents even great-grandparents, aunts and uncles were all killed to the tune of 26-27 people killed in Afghanistan by the United States soldiers by their orders given to them. All the people whose lives she has saved and helps to get lives back, surgeries, therapies, everything they have needed to get a new start in life, was and is being paid for by her gold certificate loan money. For the past 17 years she has started an organic food making business with these people who she has brought to Santa Fe and other areas around Santa Fe and house, they have been growing, preparing and selling at very affordable prices in little carts all over the city and outlying areas for the people. As the day comes to an end they give away to the homeless what they have left. Many people give donations over and above what they buy to help pay for the poor and homeless people to eat. This is one example of a Faction 3 White Knight doing what the Dalai Lama suggested in his text message to me today. There are as many ways as there are people to follow this Good Red Road and help people. The Cabal is behind these other programs; they will be arrested and these programs will cease and desist. Bernie Sanders, Elizabeth Warren, Oprah Winfrey, Michelle Obama and Randy Rhodes, names we have mentioned many, many years ago, have been continuously joined by so, so many others as Faction 3 White Knights build and grow. They continue to meet and plan the orchestration of this true NESARA Law transition with so many countless other Faction 3 White Knight to create a smooth transition for the whole World. Galactic participation is totally required and ongoing. They said arrests are guaranteed anytime, anywhere, right in this moment in time. The UK economy is falling apart; the EU without the UK during the Brexit transition cannot survive. The tariff war that Mr.Drumpf has instigated is already causing severe hiccups in the United States economy, which is faltering severely. The news is saying that Mr.Drumpf’s polls amongst his Republican supporters are up to 88%. What they are not saying is that the Republican Party has shrunk to around 20% of the American people at this time. Through the power of intention and Unconditional Love we can write a new reality to step forward into our full potential as we embrace the ground, the grandness of who we are. To conclude, Mr. X, Natasha and Red Rock Rainbow Hawk said "Mr. Avenatti has 12 audeo tapes from the Michael Cohen raid. On those 12 tapes there is irrefutable evidence about all the treasonous activities of the 13 Families for at least the last 40 years, including and especially 9/11 as the inside job. Mr.Mueller will step down. Mr.Patrick Fitzgerald will step up to the podium and with the assistance of the convictions contained in the 4 War Crimes Tribunal results plus these 12 tapes, we will see mass arrests and the enactment of NESARA Law and Full Disclosure – all! Continue to practice random acts of kindness, blaze the Violet Fire; call on Mother Sekhmet. And as Robbyne said, we are entering the final lock into NESARA Law, Universal Economics and Divine Government fully anchoring in our beautiful water Planet. As this Eclipse comes through, this is going to get more chaotic. As Mother said, keep shining the light into the places in our Congress and the halls of the mighty and powerful, above and below the Earth. There are no more secrets. Love to all. Light to all. Thirteen thank you’s and honey in the heart and no evil! NESARA now! Michelle for leader of the Wise Council of Grandmother Elders for our Planet! Okay! Thank you, bless you; we could use some help to get our Beneficial Farms. Coming up here in the next week or so we’ve got to make another $150 contribution. As you could make up in $15 increments or you could send more; just make sure as there are 3 or 4 times that you want to send, that it adds up in that increment. You have to sign up for PayPal to send money to family and friends so they don’t take money out; otherwise they do. Our website is http://2013rainbowroundtable.ning.com. Please help our sister Fran and all of us to be well and be love. And do not despair, Everyone! This is not going to go anywhere but forward now. The energies coming in can do nothing but bring what we've been waiting for! Thank you, and I pass this rainbow talking stick with fairies and crystals and love to my sister Fran.